ADD-on-GYAN Educational Services (AOGES) in an Award Winning Startup began on 24th December, 2010 and dedicated to the overall growth and development of school students in India. Our Company recognizes the inherent problems in the Indian Education System and works in the education sector where we provide Value Added Education to school students from classes 6 – 12 through projects, practical training, career education etc. Our Company’s sole aim is to empower students and help them take crucial decisions at the most important junctions in their lives along with adding value to the vast Human Resource of India and facilitating greater R&D. – Only 25% of graduates passing out in India are considered employable (Mckinsey-Nasscom Report). – Even after 16 years of rigorous studies, Indian students need to be trained from the very basic when they join a particular company, as employees, after graduation. This is due to the lack of coordinated theory and practical education. – The course content is vast in the school as well as the university curriculum and is covered in a comparatively smaller timeframe, while the medium of education being auditory and visual mostly, which are less effective than practical learning, due to which the effective learning is drastically reduced.So, we came up with this venture to cover these loopholes and give a multidimentional and holistic approach to education in India. We are already one month into running our pilot model at Madhav Kripa School, Manipal and the response that the product is getting from the students of Standard VI – X is extremely encouraging. The interest levels soar to their maximum during the Gyan Labs sessions operated in the school. 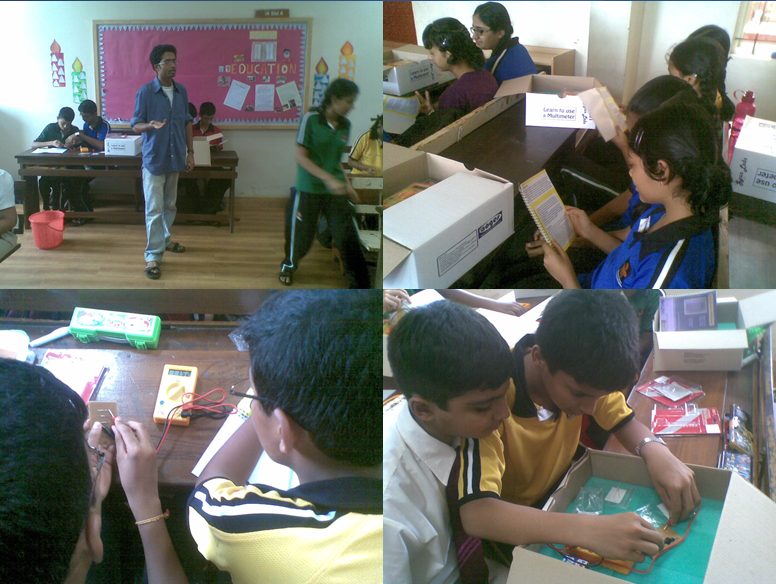 The kids can be seen exploring the electrical and physics components with amazement. Although, using a multimeter or seeing a resistor in action is something that they have never experienced before, but the interactive manuals and the helpful Lab Personnel ensure that they understand the nuances quickly. In no time do they go from, “What is all this?” to “Why can’t we connect a 1.5 V LED to a 9V battery?” and every possible conceivable question. They get to work on project kits ranging from ‘Learning to use a multimeter’, to ‘Making an electromagnet’, to ‘Exploring Eddy currents, and finding out ‘How the Hydraulic lift mechanism works’. And the hands-on approach is definitely a hit. The students also get to make innovative things such as ‘Lava lamps’ and have fun with ‘Squishy circuits’, at the same time, getting valuable knowledge through keen observation. Having taken the feedback from students periodically, here is the result that our team has got. 94 % of the students find the Labs very interesting; 93 % think that they are highly innovative and a whooping 100% want more of such sessions in their school curriculum. The Gyan Labs team and its directors are also excited about the response. They had prepared a workbook for the students of the school and distributed it free of cost to see whether it garnered interest from the students fuelling their quest to know more about science phenomenon occurring around them in the natural world. The students were given the books and advised to work upon it. The book has various sections dedicated to topics like Biography of various ancient & modern Indian Scientists, steps and scientific procedure to be followed while conducting experiments and doing projects and some pages on coolest inventions and the amazing world of robotics. The book also has 20 MIYs (Make It Yourself) projects, which can be done at home with everyday stuff under parent’s supervision, and include fun experiments like making floating soap bubbles, making things glow in dark, creating invisible ink, constructing a mini-greenhouse etc. The team at Gyan Labs is working on devising more of such projects in the coming time so that they can provide students, insight into the fields of not only sciences, but also other subjects. Manipal The Talk.Net and its entire crew wished AOGES All the very best with its ventures and looks forward to more such creative test runs from the company! AOGES, as an idea, was developed in September, 2010. It participated in The Venture at Techtatva 2010and secured the 1st Position, along with INR 60,000 as the Prize Money. Next, the idea was presented atProvenance, the Intra-Manipal University Business Plan Competition, where it finished at the 5th Place,winning an opportunity to incubate at MUTBI. AOGES was the first to grab this opportunity, ahead of the7 other teams, who were also given the same opportunity. Apart from this, AOGES finished among thetop 10 ideas from all over the world, at ideas4all.com’s BIG BANG CHALLENGE 2nd edition, Spain andrecently it finished 3rd at IDEAS B-Plan Competition at IIT Kanpur where they won INR 75,000 as cashprize and a lot of accolade from the Judging Panel comprising of Venture Capitalists. Currently, AOGESis one of the 36 semi-finalists at NEXT BIG IDEA (India’s Largest Business Plan Competition) organizedby DST, Intel and IIM Bangalore. AOGES is currently setting up its first Lab (known as Gyan Labs) at Madhava Kripa School, Manipalwhich would cater to students from Grade 6 – Grade 12 through 30 innovative practical project kits. Inthe initial stage, projects would mostly cater to the Science topics but phase II of development would bededicated to other subjects as well. Team AOGES has, till date, generated 90 of the 150 ideas that areto be setup at Madhava Kripa School and is currently developing the kits for the first set of ideas for theschool. AOGES has a 30 member working team, with Priyadeep Sinha and Abhash Kumar as the Directors andProprietors, and a support team of six final Year, seven 3rd Year, ten 2nd Year and five 1st Year Studentsof MIT, Manipal. MUTBI is extending all possible guidance to the team through its Secretary, In-Charge,Dr. Manohara Pai M. M. The team also has expert guidance and mentorship from Dr. Kusum (Principal& Academic Coordinator, Madhava Kripa School), Mr. M. Chandrasekaran (Board Member, ManipalGroup), Mrs Vidya Kini (CA & Director, Vidya Kini & Co.), Mr. Pulak Kumar Sinha (Deputy GeneralManager, State Bank of India) and Mr. Dilip Kumar Mishra (Officer, Central Bank of India).